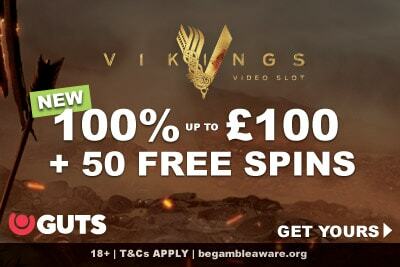 UK Guts Casino Bonus: Are 50 Free Spins On Vikings Slot Worth Your While? Guts casino have launched a brand new UK Casino Bonus giving you 100% bonus money and an awesome 50 free spins on the Vikings slot by NetEnt. It looks good, but are there any pitfalls to this new bonus offer? It’s always tempting to jump straight into a new casino who promise you a big welcome casino bonus, and hope that the T&Cs won’t come back to haunt you. But, they usually do, and rarely in a good way. Thankfully we are here to break down the full Guts UK Casino bonus, read all the terms, and let you know if there’s anything that will hold you back. The good news? The Guts free spin bonus comes with NO WAGERING requirements! The bad news? Well, read on to find out. It’s not the biggest out there, but what Guts lack in size they make up in skills and overall experience. Seems easy enough, and to be honest it really is. The mobile casino Guts have built a solid reputation with players for their no-nonsense attitude and easy to understand terms. When they say that’s what you get; that’s what you get. When you first login you’ll probably have a look around and notice that there’s a reward section. It’s where any bonus you collect along the way pops into your account. It’s not particularly useful for that first deposit, because while you can claim your deposit bonus by clicking on that first deposit casino bonus or (more likely) you’ll click on deposit and there it will be! However, it’s good to take note how to get to that rewards section, because once you’ve made that first deposit and played through your bonus, you will have 50 free spins on Vikings waiting for you. Waiting where? In the Rewards section. Click on the rewards and the game will open up for you to play. Any special terms and conditions for the deposit bonus? All online table games and video poker games count for 0% towards clearing the wagering. In short; deposit using your credit or debit card, and make sure you play your mobile bonus on slots within 30 days. If you are having trouble figuring out the wagering, why not use our free wagering requirement casino calculator? What about the Vikings casino free spin bonus? This one is even better because Guts free spin bonus offers never have any wagering requirements. Meaning anything you win from play on the Vikings slot machine is yours to keep. The free spins will be waiting for you in the reward section. The lesson to learn from this free spin mobile casino bonus is that you need to set an alarm or reminder or something to log back in and claim your bonus. You only have 24 hours to play your Vikings slot free spins at Guts, after that, you lose them. And who wants that? Is this UK casino bonus any good? You can’t use an e-wallet to make that first deposit, so you have to trust that Guts is a legitimate casino. They’ve been on our recommended casinos list for years, for good reasons, and have one of the best reputations with online gamblers. But you’re the only one who can say for sure if this is what you want to do. 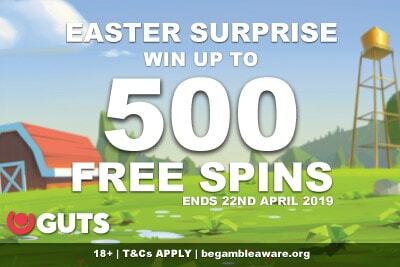 The fact you only get the 50 free spins split over 5 days rather than all at once is also a little annoying, but we just see it as an opportunity to log in and play casino throughout the week, without having to make another deposit if we don’t want to. The real crux of whether this offer will have you jumping for joy or wondering why you even bothered to get dressed this morning is down the free spin games. The deposit bonus you can play on any of your favourite slots, with a pretty standard wagering, making it a good offer. But is the Vikings slot good? Is it worth taking the time to login every day for 5 days? Well, if you follow the link above you’ll get access to our full slot review and you’ll see we rated this game very highly. From a bonus perspective, what’s amazing is the fact that you can win 10,000 times your bet. With a minimum bet of 0.20 a spin, that’s £2,000 in your pocket if you hit the higher end of the pay scale. 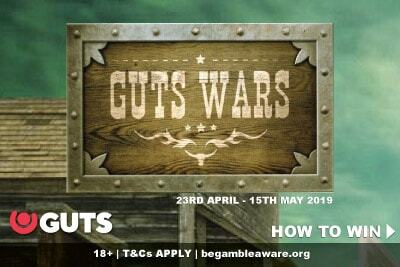 And as Guts have made this a wagering free casino bonus, you would get to keep or withdraw that £2,000 instantly. It doesn’t matter if you play 10 spins or 100 spins. One spin is all it could take to turn the tides of war in this Vikings game. Get 100 Wager Free Spins on your first deposit. Vikings is a fairly volatile slot machine and based on the TV show with the same name. 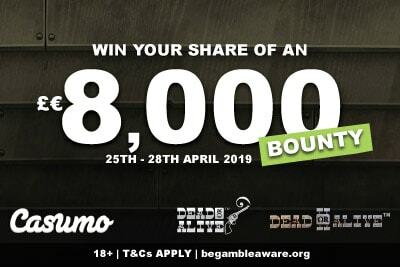 Which means that yes, you could walk away with £2,000 from a free spin bonus, but only if you hit the free games within the slot and have an amazing round. The Vikings slot is a 5×3 reel machine with symbols that pay adjacent to each other left to right – it starts with 243 ways to win. The main features are the hot spots: when a Viking character symbols lands on it, it will turn all other Viking symbols into one symbol and pay like a scatter. This slot feature is what can bring you huge wins, even in the base game; we’ve seen wins of 100 times our bet. Sure, the free spins and reel expansions are where the huge wins happen; namely because this turns into a 78,125 ways to win. That’s because this 243 ways to win machine turns into 78,125 ways to win slot and it’s crazy by almost anyone’s standard. Beautiful, unusual, high paying… this is NetEnt at their best. Add an amazing fair casino giving you free spins bonus on this top game, and what else could you ask for today? Check out Guts and their bonus. Deposits by Skrill, Neteller and Paysafecard are excluded from this offer. Once the welcome offer is selected, deposit the minimum amount of £10 and Guts casino will match whatever you deposit as a bonus up to £100! The bonus must be wagered x 35 in 30 days before it can be withdrawn. You’ll also get 50 spins to use on the Vikings slot, paid out at 10 free spins per day for five days – absolutely wager free. These are valid for valid for 24 hours. Only one bonus per person. 18+ only. Gamble Responsibly.